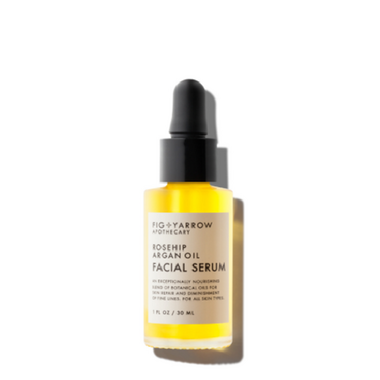 Fig + Yarrow Rosehip Argan Facial Serum is an exceptionally nourishing blend of botanical oils for skin repair, diminishing of fine lines, moisture retention and protection from environmental factors. It offers a combination of plant derived oils for a dense dose of antioxidants and nutrients that penetrate deeply and nourish on all layers. Argan's well-deserved reputation as a miracle oil for skin care is due, in part, to the exceptional amounts of beneficial constituents such as triterpenoids (for healing and protection), unsaturated fatty acids (antioxidants), tocopherols (neutralizes free-radicals for anti-aging benefits), saponins (skin-softening) and rare plant sterols (for moisture retention and inflammation reduction). Argan oil: a miracle oil for skin care is due, in part, to the exceptional amounts of beneficial constituents such as triterpenoids (for healing and protection), unsaturated fatty acids (antioxidants), tocopherols (neutralizes free-radicals for anti-aging benefits), saponins (skin-softening) and rare plant sterols (for moisture retention and inflammation reduction). Organic Jojoba: Promotes skin health without clogging pores, acting as a skin protectant and cleanser. Combats bacteria and soothes the skin of fine lines and naturally slowing the aging process. Squalane: Diminishes the production of excess oils in the skin. An excellent hydrator leaving the face soft, plump and moisturized. Directions: Warm 3-5 Drops between hands, gently press and massage into face, neck, and decollet. Best used alongside the Fig + Yarrow Complexion Water.